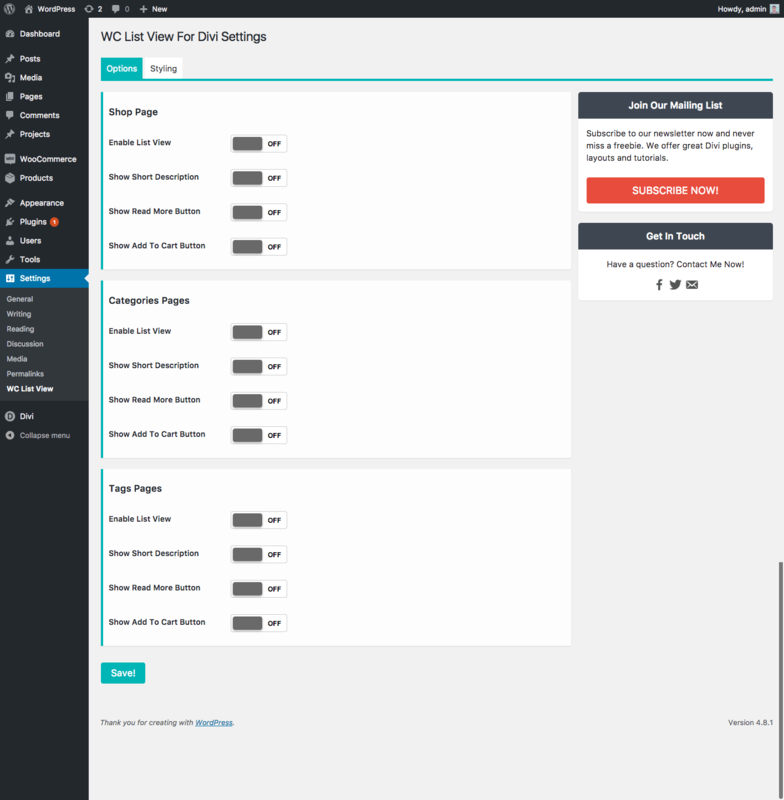 Just upload the plugin like any other wordpress plugin and after activation, you can use the plugin and change settings under Settings -> WC List View. PS: This is the initial release of the plugin, if you are facing any problems, please comment below and let me know. The plugin requires Divi theme, it won’t work with Extra but I may add this functionality to work woth Extra in the next updates. 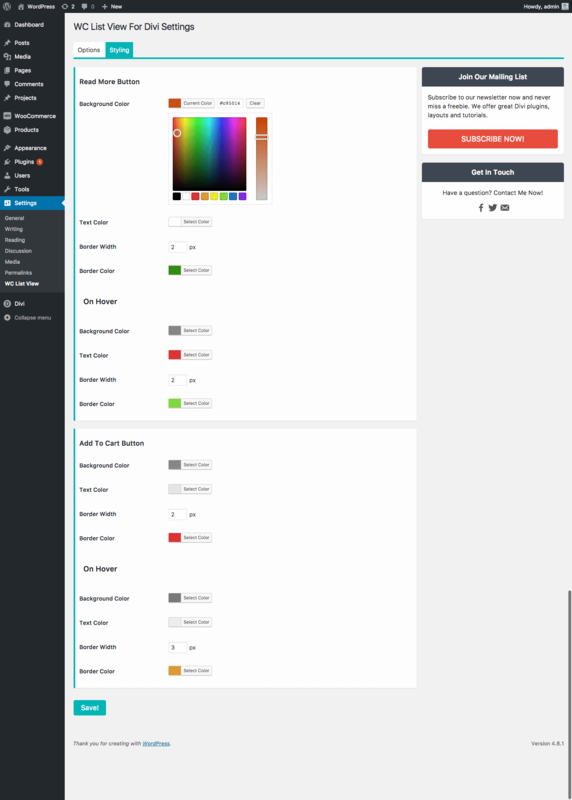 Does the List View change the display of the Divi Shop module for the shop page, or will I need to use on woocommerce short code for list view to work? The plugin does not work with the shop module, only with archive pages and shop page. Okay thanks AbdElfatah, I’ll give it a try without the shop module. All the best. How did you add that link? Just copied wc-list php read more button. The plugin doesn’t have a file named like that. Hey, just checked and everything is working fine. 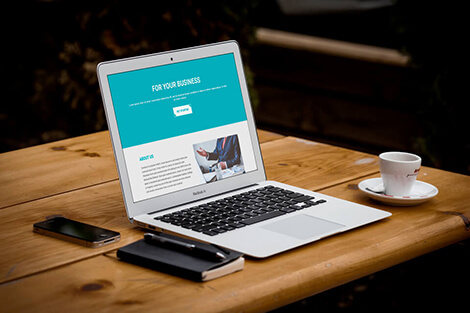 What version about Divi you are using? Hi, thank you for a great plugin. Thank you! The plugin works fine with the tags, I’ve just checked. Are you using another plugin that may affect the tags pages? Hi, not that I can think of. That’s strange then that it doesn’t work on my site. A question: Is it possible to customize the “add to cart” button or “read more button”? I would like to link it to a specific landing page. Thank you. No, you can’t change the buttons links. Ok, I have a real question now. 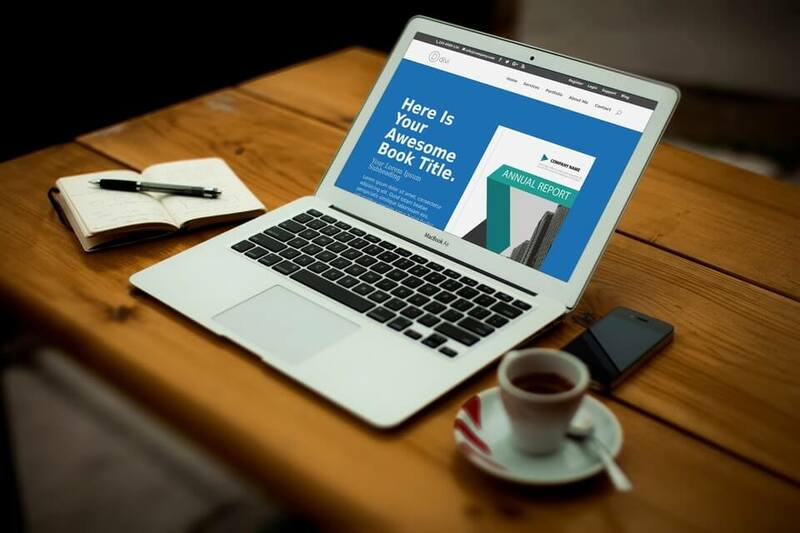 I’m using pages I create using Divi shop module for my category pages. I use the shop module and select categories to display. Will this work on that page? It’s not currently working on mine. As an example, I create a page TrueNas-X-20, and on that page I add a header and the shop module. Then my navigation points to mysite.com/TrueNas-X-20. That’s where I want the read more button (for instance) to show up. The read more & add to cart buttons won’t work with Shop module. Will any of it (short description, for instance)? If not, what do I need to do? Thanks. All the elements will only work with the default archive template, not the shop module. Is this plug in still relevant? because I found it interesting but I don’t wan it to crash my site. Yes, it is. You can use it, no worries. 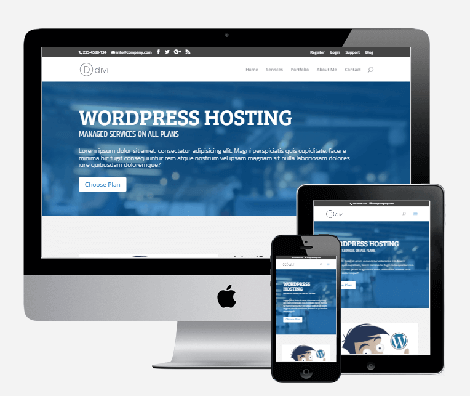 – Upload the plugin to your website. – Go to your admin dashboard -> Settings -> WC List View. – Make your changes as you want. 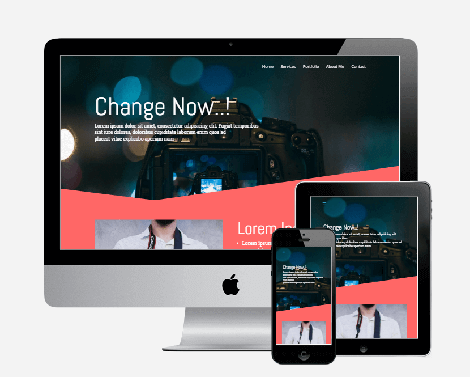 The plugin works only with Divi theme. Thank you for this free plugin! 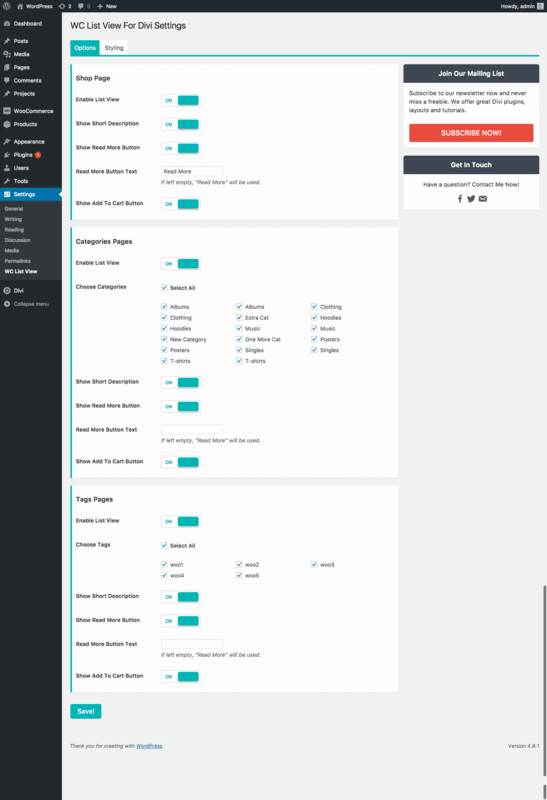 I understand this plugin doesn’t work for shop module, but do you know a way to have this list view in a page built with the divi builder? Unfortunately, no, you have to use CSS if you are familiar with it. 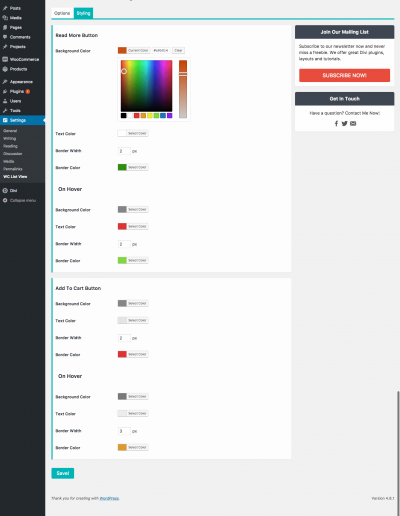 My shop page is set as Full Width but it displays with right sidebar with the plugin activated. 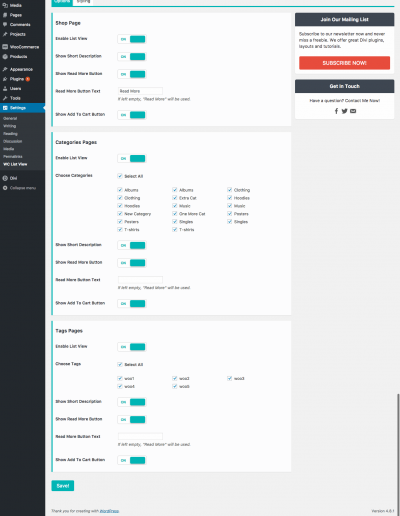 Also, since this is only for Divi, how can we integrate into a page with a footer and header and such? Since I can’t use the Divi Builder and add sections and modules on the shop page how are we supposed to make this work on our site? Is there a demo somewhere of a site (or sites) successfully using this? 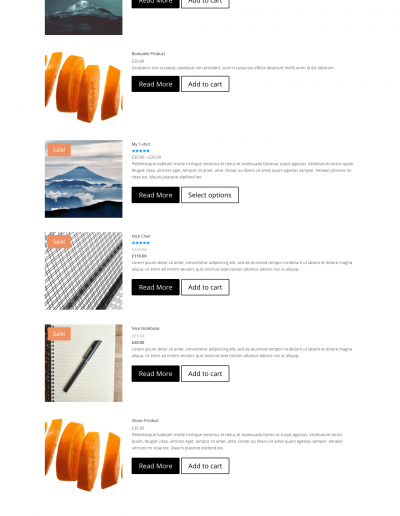 The plugin works with Shop page, categories and tags pages. It has nothing to do with the sidebar or anything, It works with the default WooCommerce pages, not layouts built with Divi. Nice plugin – I wish it did more, but for the price it is great! 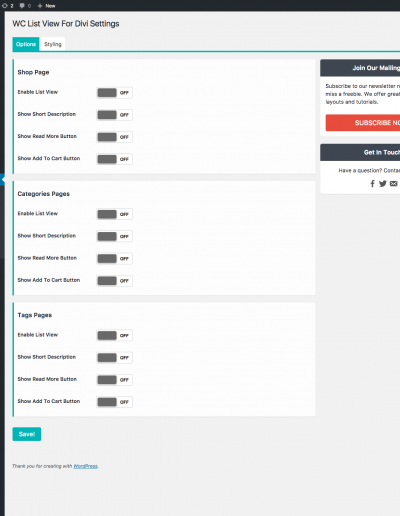 Does it work with your WooCommerce Builder Category Page using your Archive Layout?